After breakfast at the Macdonald Hotel we picked up our packed lunches and set off up the steep climb out of Kinlochleven. The rain had stopped, but the skies still looked heavy. 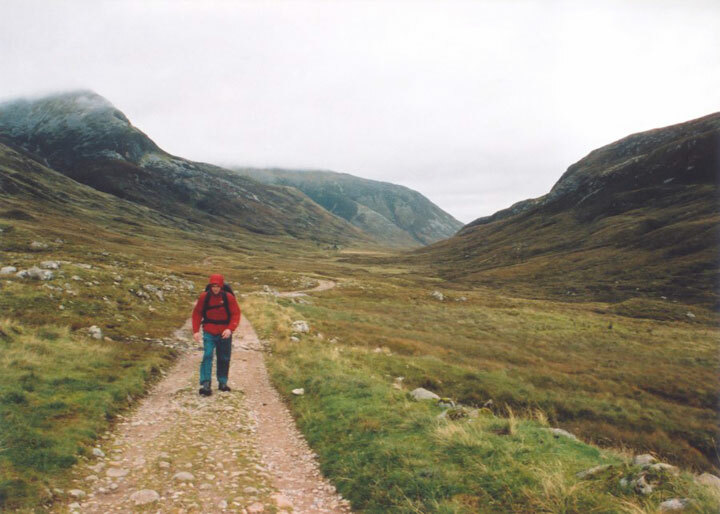 The last day takes you into the remotest section of the West Highland Way, with no settlements by the path between Kinlochleven and Fort William, with only a handful of farms even further afield. 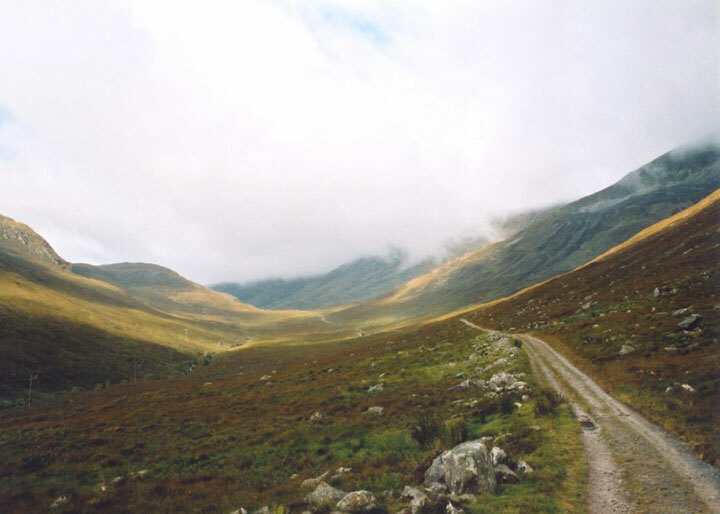 It runs along an old military road as it follows the course of several burns weaving their way between the surrounding mountains. 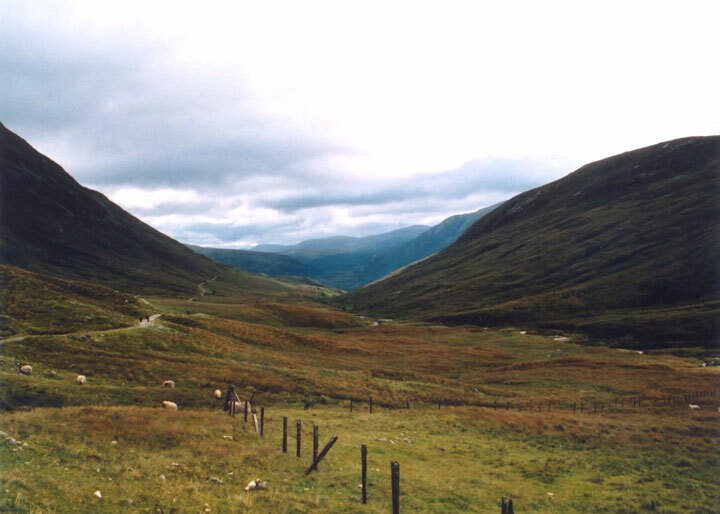 Walking beside the Allt Nathrach there was suddenly a deafening noise overhead as a Tornado flew through the glen, with it’s partner audible in the next glen, Glen Nevis. It wasn’t the last plane we’d see today speeding through the narrow glens. 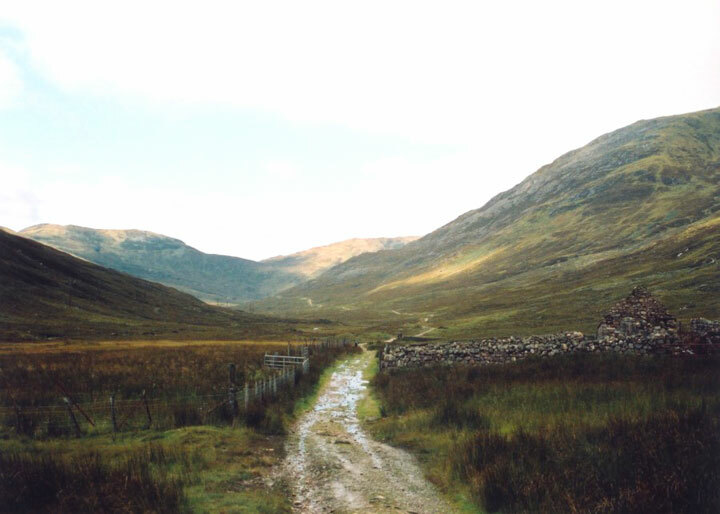 The first thing of any note on this leg of the journey – besides from the stunning scenery – is Tigh-na-sleubhaich, a ruined farmhouse sitting isolated in the glen. 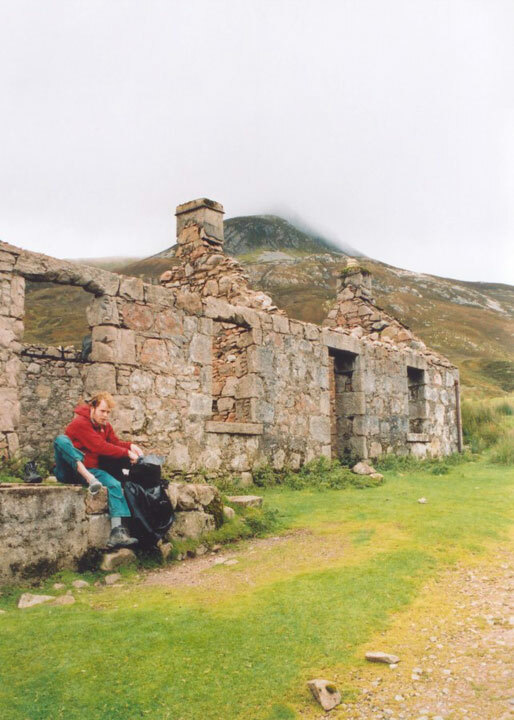 At first I thought it’s present state was due to be left empty for decades, but in fact it used to be a bothy until relatively recently, but some irresponsible walkers broke up the door and roof timbers to make a fire. Beyond Tigh-na-sleubhaich the glen widens slightly into Lairig Mor and curves northwards around the base of Sgurr na h-Uilinn. Just before the track disappears into the forest, we stopped to have our lunch. After our cheese and tomato sandwiches, we entered the forest, walking past a cairn that marks where an unfortunate soul is said to have died following the Battle of Inverlochy. By now the weather had improved greatly, and as we left the forest the grey, wet clouds had lifted to reveal a beautiful blue sky. 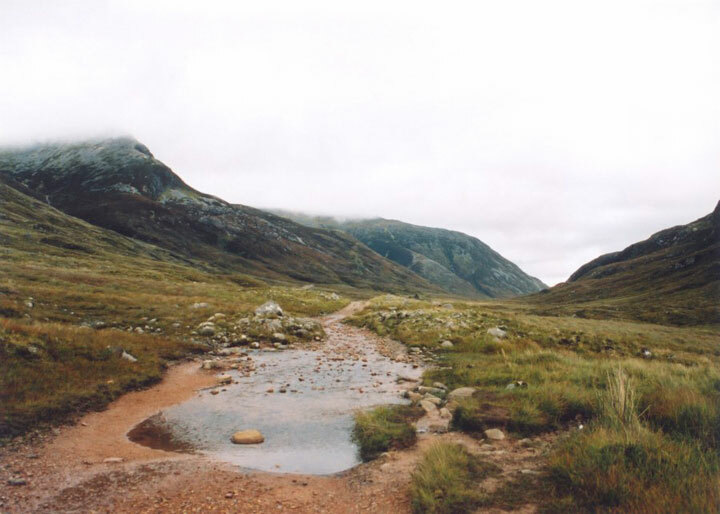 We got our first glimpse of Ben Nevis, shrouded in white clouds, from the now open track. Then it was back into the Nevis Forest. As the path climbed and climbed, our twisted ankles and knees felt worse and worse, and we started scouring the forest floor for suitably-strong sticks we could lean on, cursing ourselves for laughing at the guy on the first day with Leki poles. Eventually we struggled our way to the summit near Dun Deardail fort, but by this point the 500 metre deviation to see it was just too much. We had one thing on our minds, and that was finishing as soon as possible. 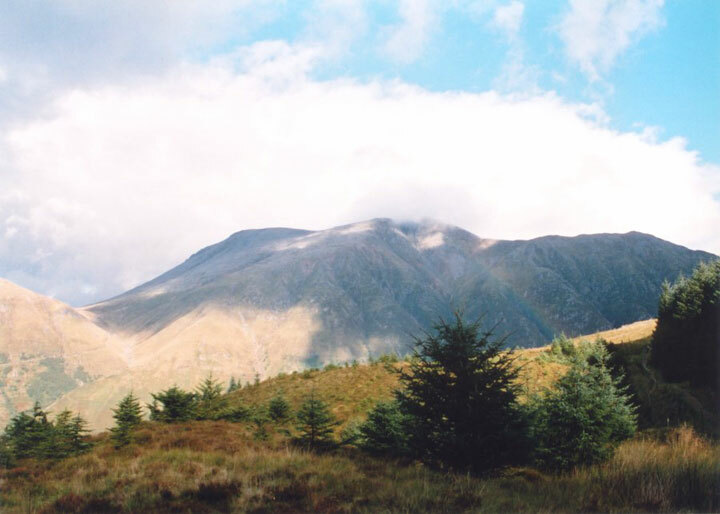 Then the clouds lifted on Ben Nevis, revealing the highest mountain in Britain in it’s full glory. It was all downhill from here, and with Fort William visible in the distance through break in the trees, we made good progress, dreaming of the end. 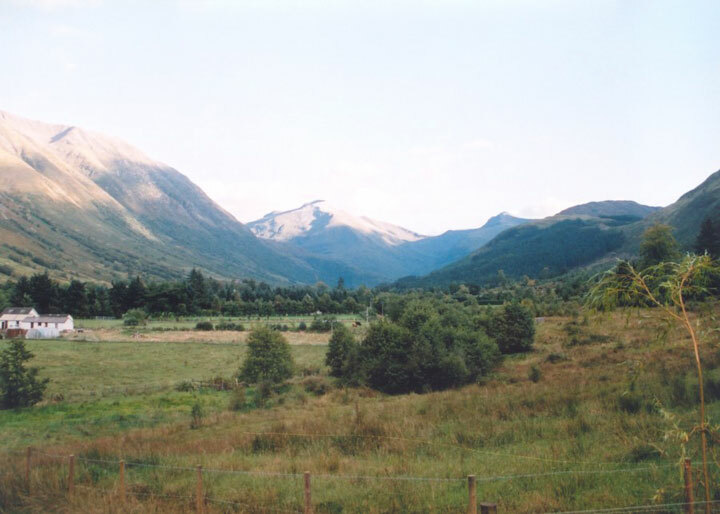 As we came out of the Nevis Forest we were back on flat ground, and as we walked along the edge of a field to the road there was a magnificent view up Glen Nevis. 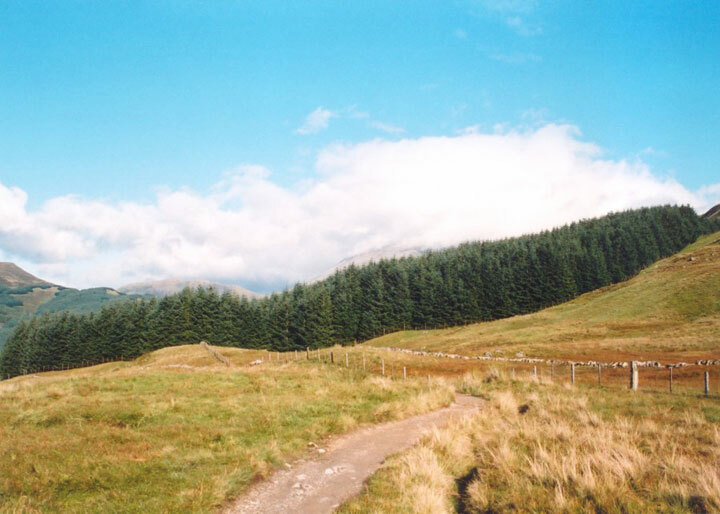 The West Highland Way from hereon in is just the footpath beside the road, passing the Wishing Stone on our way. 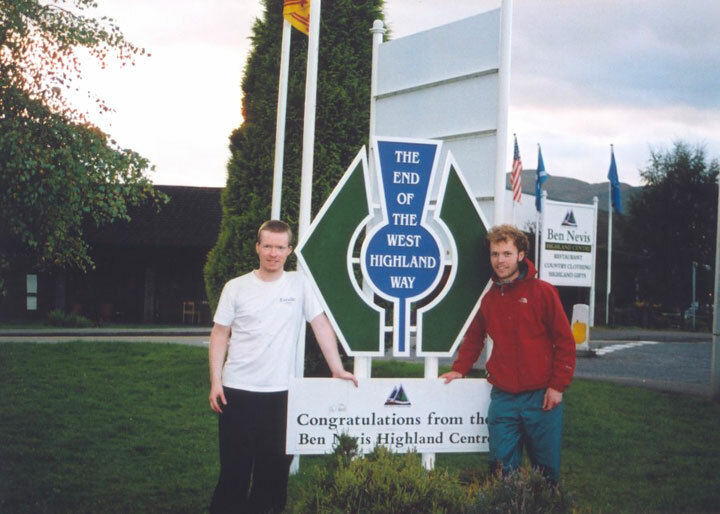 Then as we rounded the corner, all we had left was a seemingly long, straight stretch of road (in reality less than a kilometre) before we finally reached the official end of the West Highland Way. We’d arranged to meet our friend Bruce who’d driven up from Blairgowrie earlier in the day, so he gave us a lift out to Corpach where we were all staying at the Farr Cottage Activity Centre. After we’d had a quick shower, the guy running the hostel ‘phoned a taxi for us, and we were given a potted history of Fort William as we were driven into town. First stop was the Grog & Gruel, a pub recommended to us by the English lads we’d met during the week. And what a good recommendation it turned out to be! A good atmosphere coupled with great ales and fantastic food was just what we wanted after finishing a hard week’s walking. 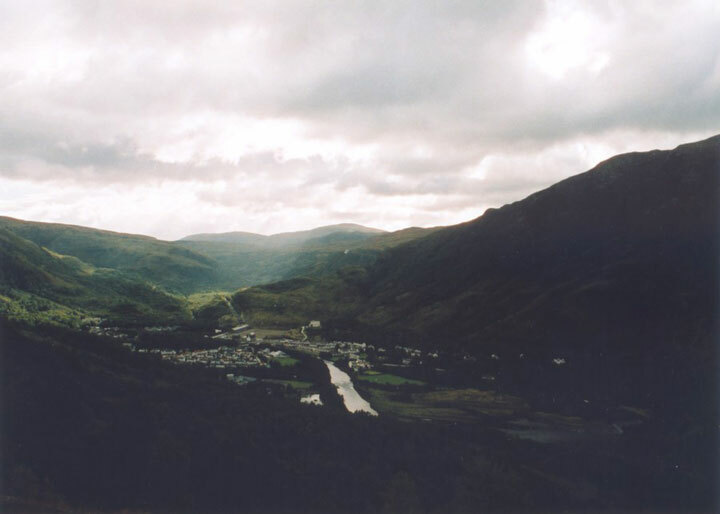 After boring Bruce to death with West Highland Way stories over a few beers, we decided to see what else Fort William had to offer, and went in search of more pubs. At the tail end of the tourist season, the centre of town was deserted, and distinctly lacking in pubs. Eventually we found one, The Maryburgh Inn, so in we went, only to find that it was karaoke night. We stayed for a pint and watched an incredibly enthusiastic performer from Liverpool go through his repertoire, then headed back for the Grog & Gruel for a couple more pints before getting a taxi back to Farr Cottage. Published on the 23rd of September 2004 at 10:03 pm. Updated on the 4th of June 2017 at 11:19 pm.